Coach Ayers starts off the Mic'd Up Series. I wonder if I came up with 3 gallons of gumbo would Coach Nash give me a O-line tshirt? Are we going to get anymore mic'd up? Working on getting some more football videos out this preseason. Spartan High playing week 0 and week 1 at home, with the projects surrounding the new arena construction have slowed TerrierVision. Also the preparation for all home football games to be on ESPN 3, has added work to the preseason that was not normally there. Make sure everyone has access to ESPN 3 this fall, because the majority of Wofford football games will be streamed through ESPN 3. And those of you who like to watch games at local establishments, encourage them to purchase Apple TV, Roku, Chrome Cast, etc.. type devices so that they will be able to show Wofford football games on their TV's. 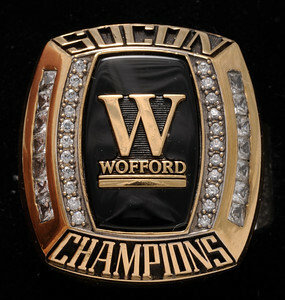 Do not fear though, Inside Wofford Football is not going anywhere and will be here every week of the season. OK, I'll bite- How do I get the Wofford games on Roku? I imagine it will be similar to AppleTV or Chrome where you have a subscription to a service and then utilize ESPN3 app to access all games. This is my main issue with ESPN3. It is difficult to watch on a television. Even providers which provide ESPN3 for mobile phones and tablets will block this content for Roku devices (Comcast is bad about this). There is a WatchESPN app for Roku you can try, but your provider may block this. The espn link above is a great resource listing all of the watch ESPN apps. Obviously you have to have a cable subscription login to access all of this, as ESPN does not offer any other way to view ESPN3 events at this time. Wofford (and the entire Southern Conference) this year entered a 5 year agreement with ESPN for rights to our broadcast. This year it is all football, and conference games of both Men's and Women's Basketball. Next year we will do all basketball games on ESPN3 with football. Then from there we will branch out and start covering other sports on ESPN3 such as Baseball, Soccer, Lacrosse, or Volleyball. - The ESPN deal runs through the year 2021. In addition to their sports coverage, we'll also get the added value of their unwanted journalistic pieces spiced with political agenda. My wife and I get ESPN3 on the IPad and use Apple TV to put it on the flat screen. It works fine for us. What I was referring to is how to get ESPN3 on Roku. OK, found it! Didn't know Roku had an ESPN app and channel. I think I am going to be able to watch Wofford on my TV! !